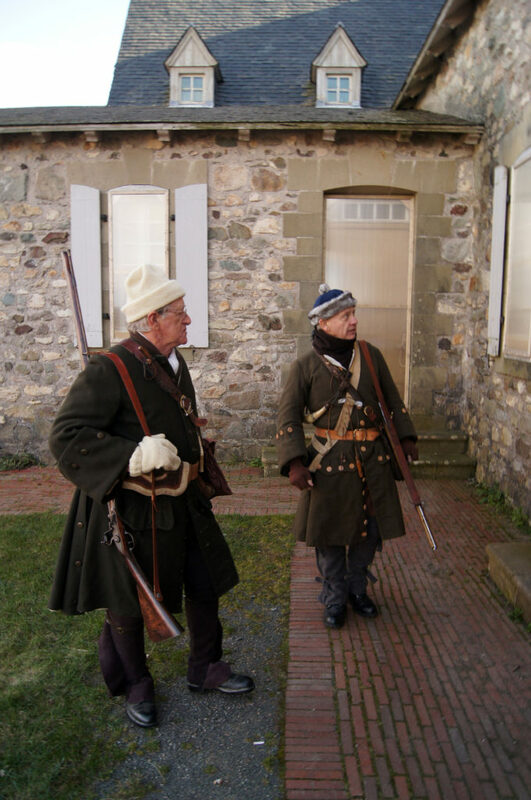 Ever wonder what it was like for the French soldiers protecting Cape Breton Island back in the 1700′s? Ever imagine yourself having to cook your own meals over an open fire which you started by way of flint and stone? How about sleeping in canvas tents with beds made from straw and being awoken by the sound of marching feet and cracking muskets. 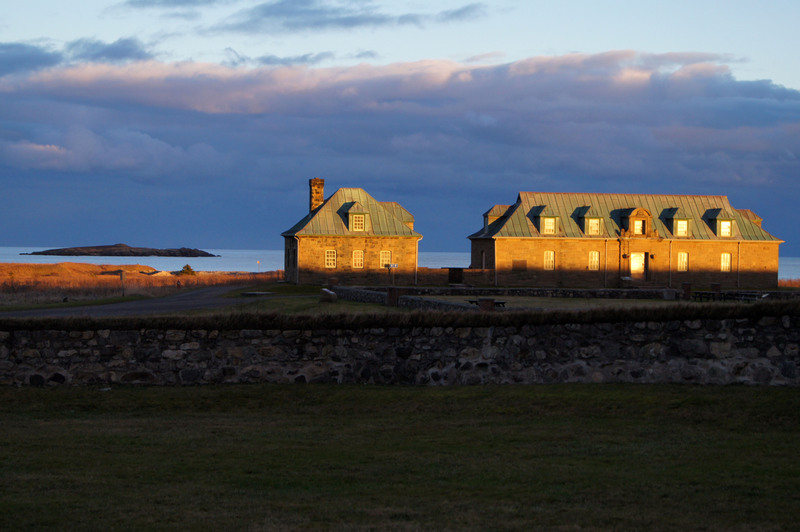 Well dream no more and head to Canada’s largest National Historic site – Fortress Louisbourg on Cape Breton Island, Nova Scotia. The folks at Parks Canada are now offering some incredible experiential programs for kids and adults alike. 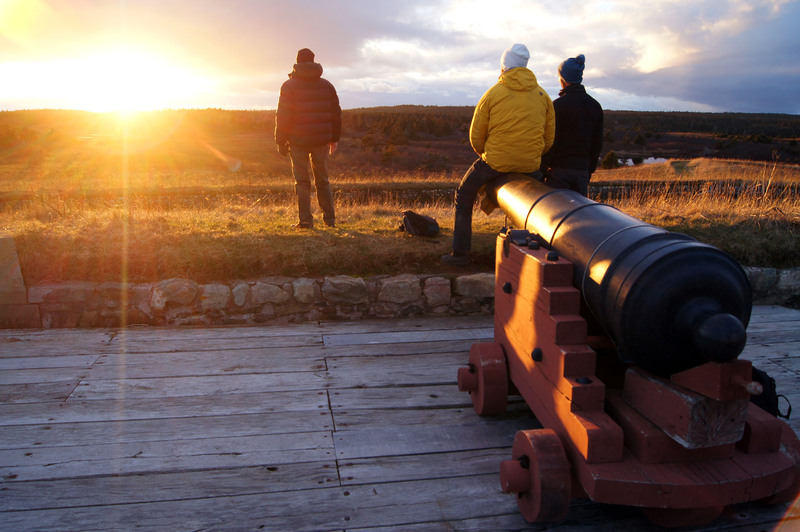 The Fortress Louisbourg offers up many adventures. I had the privilege to be invited by my good friends at aforadventure.ca along with 17 other outdoor enthusiasts to experience firsthand the new programs that the historic site is offering to visitors, giving you a real feel for what life and times were like living and working at what is now the largest reconstruction of a fortress in all North America. Arriving on the first night we were greeted by park staff who of course were in full character and dressed in the attire of the mid 1700′s. The conversation and spirits began flowing as we got to know the other members of the group which we would share many unique experiences for the duration of the weekend – and what a weekend it would be. We feasted on soup and baked bread from the era, while rum sampling and creating our own truffles “Salon de Chocolate” started the festivities before being entertained by local musician – Jonathan Canary. Pouring out of his acoustic guitar were both original tunes and covers, including Tenacious D’s “The Best Song in The World”, just given er’ and breaking a string and losing his hat in the process – CLASSIC. We spent the night in the confines of the barracks, and they haven’t much changed since they housed tired and determined French soldiers during the forts heyday. A surprisingly comfortable sleep, but then again we weren’t on high alert like the French were, anticipating an attack on the fortress from the rival English. We rose from our slumber to a glorious sunrise with a number of group members joining in on a morning Yoga session in the chapel. Once again the park staff were working hard to serve up yet another tasty meal. After fueling up on coffee and a hearty breakfast we were off to learn more about the Fortress and the many buildings that have been reconstructed to their original state. This was no easy task. In the early 1960′s the Canadian Government began a $25 million reconstruction project to resurrect 1/4 of the original fort as it once stood. This was not just a fort, but a working village inside the forts walls. 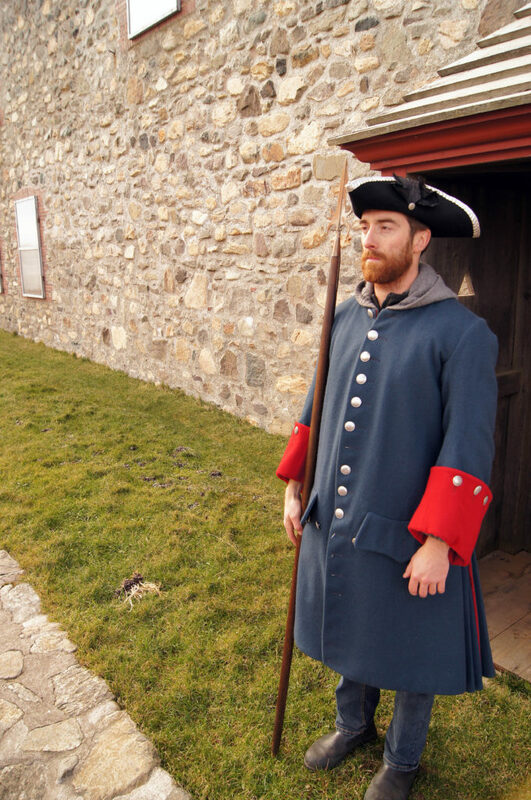 Everyone played a vital role in the success of the village, blacksmiths, gardeners, bakers and soldiers all contributed to the daily life in Louisbourg. 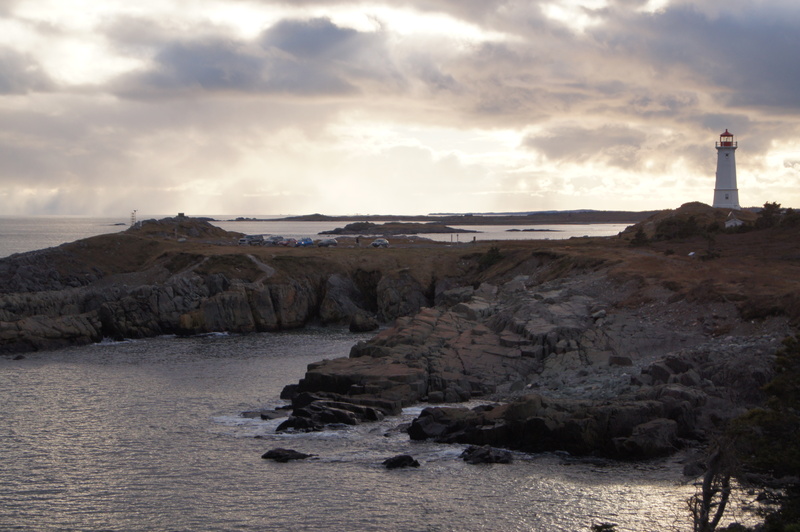 It was now time to explore the craggy coastline were thousands of tall-ships sailed past during the 1700 and 1800′s, some of which brought devastation to the area. Starting near the trail-head once sat the first ever lighthouse in Canada. Today sits an unmanned lighthouse – a twin tower of the George’s Island lighthouse in the Halifax Harbour. The graveled trail offers a light walking surface along the coast past rocky outcrops and glistening pools with low vegetation and wind beaten trees. We would enjoy a packed lunch of fresh fruit, breads and cheeses from the village, all with an unbeatable view of a rocky cove and the smell of salty air tingling our senses. As the twilight hours drew near, we found ourselves back at the fortress setting up our campsite for the night. 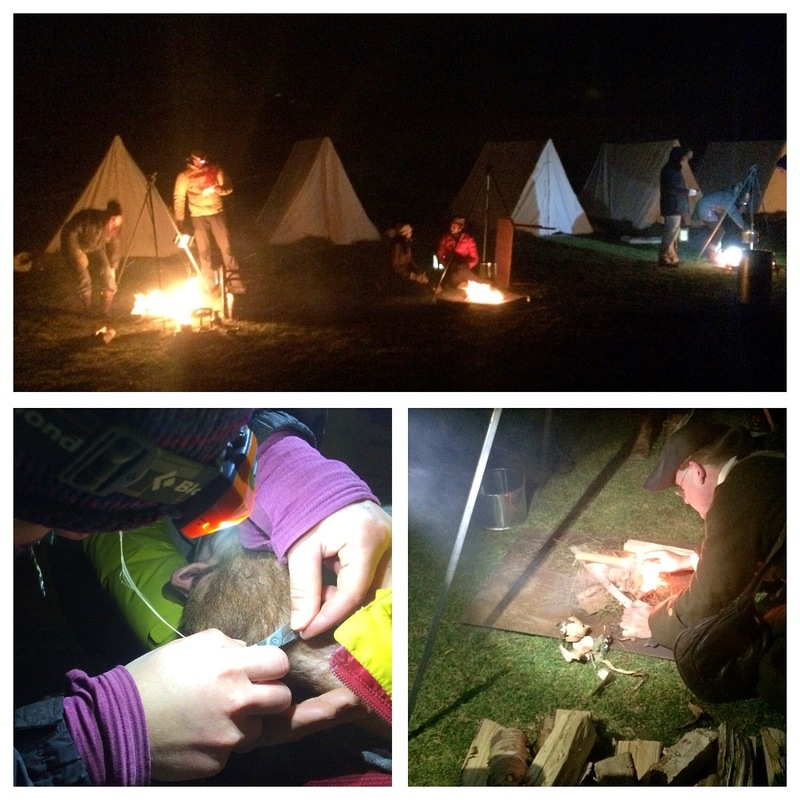 Instructions were given on how to erect our canvas tents from the 1800′s and starting a fire with stone and flint. I missed out on the fire starting demonstration while taking pictures, but it shouldn’t be that hard right? THINK AGAIN. The tents were up in a flash, starting our fire for the purpose of cooking our beef stew was a different story all together. We chipped away at most of our flint stones and the dry cloth was running low. That’s when Graham offered up his own personal fire starter – pieces of his beard, now that’s a team player. This was the secret ingredient as Clifton got the fire to a dull roar and the smell of beef stew filled the air just as a light snow begin to fall, a truly magical moment with the rest of the group singing and cheering us on. A cool air lingered and stars filled the sky. 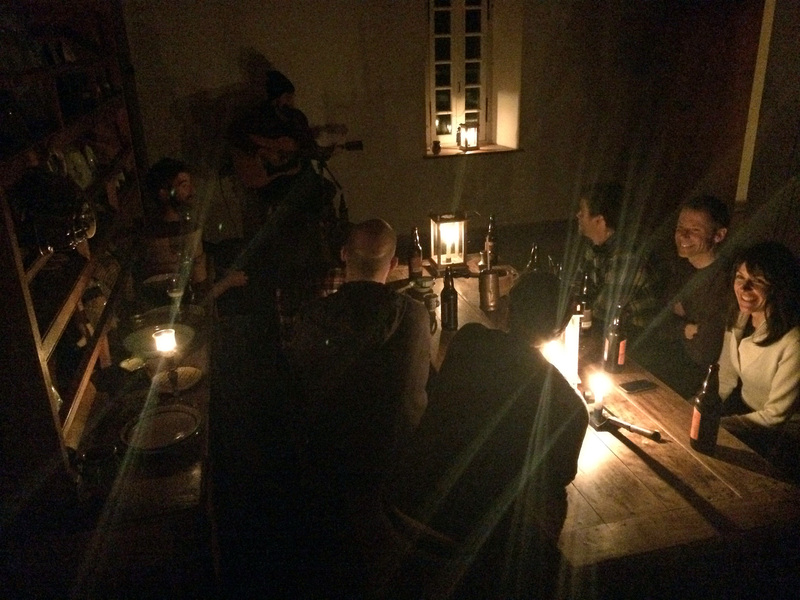 The night was full of laughter and music after a walk through town. Leading the group was a young local girl, sharing stories of ghosts who haunt the fort and cringing tales of desperate times and widowed wives. The Chapel once again rang with the sounds of instruments of all sorts – mandolins, guitars, harmonicas and the vocals from various group members who back on the mainland play in various bands out of Halifax. The resting souls of the fallen would not get much rest this night, and neither would we. Up early the next day we cooked breakfast over an open fire, gathered once again to say our goodbyes to the group and thank the lovely staff at Parks Canada for sharing such an incredible adventure for us. We had one more request before we set off back into our normal lives. With cameras ready and decked out in the trendiest of clothing, we set the stage for what’s surely the next big OSCAR WINNER!!! You guys are gonna do what, make a movie? Be sure to check out and follow the team at aforadventure who are building a following of like minded people to promote adventures for the youth and inspiring others to share the love of the outdoors within your own community.